In 2010, 3Points was established to serve clients that operate at the nexus of trading and technology. With the domain expertise we’ve established in this space, we can serve our clients faster and more effectively, since we understand most of the industry jargon and ecosystem. But industry expertise isn’t a fixed marker of knowledge, like a degree or certificate, and in an ever-evolving industry, we must constantly keep up-to-date with what’s happening in the wide world of trading and #fintech. That’s why industry newsletters are so important to how we operate: in many ways, they help lay a good foundation for our work each day. 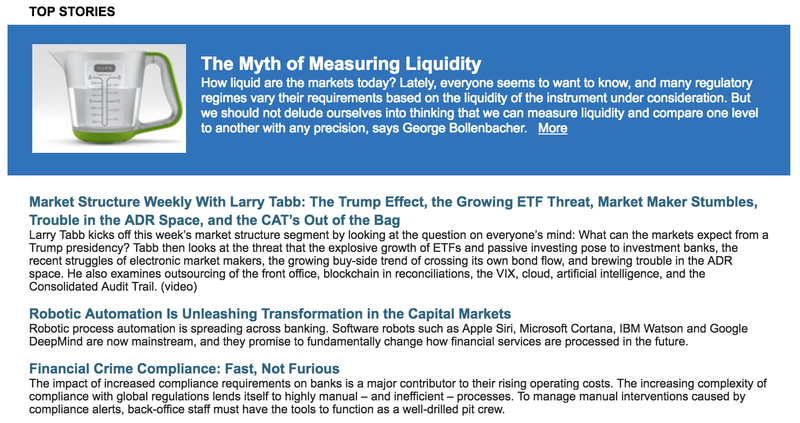 As newsletters as part our daily routines, we talked to 3Points’ trading/tech account partners, and firm principal Drew Mauck, and asked them to write about some of our favorite financial newsletters, and detail the specific things that make each one helpful. “Besides making my morning cup of coffee, of course, one of the the first things I do each day is open the John Lothian Newsletter to get a thorough understanding of what is happening in the trading industry right now. The Lothian team has deep expertise in derivatives, which means they are able to add an extra layer of commentary within the newsletter, providing helpful (and often quite funny) snippets of commentary on the industry’s top stories. 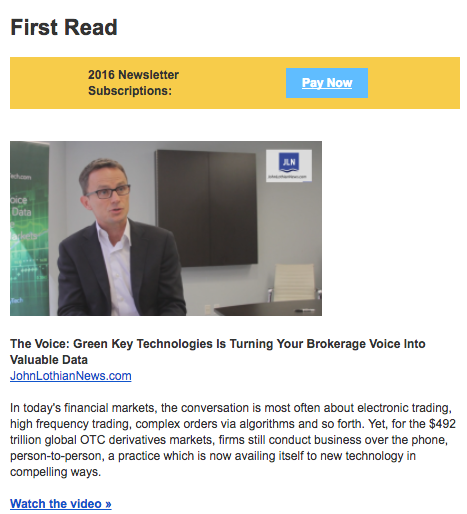 The organization of the newsletter is easily digestible, as — aside from ‘lead stories,’ which are must-reads for everyone in the industry — it’s separated into different categories within the trading world. This helps me prioritize the sections that are most relevant to my clients’ businesses and my work for them. “Curatia is one of my ‘must-reads’ when I’m seeking out news on the financial markets in the morning. It’s part of my job to stay up-to-date on what’s going on in the industry, and Curatia’s daily newsletter makes it easy for me to get the news I need. By assigning an ‘Impact Score’ to each story, Curatia helps me pick out the most important stories when I only have time to skim the newsletter to find the most relevant news. The Curatia team also helps readers manage their time when reading through the newsletter. At the top, you’ll find a ‘Market Snapshot’ graphic followed by quick commentary on the most important developments in the industry. For each story, Curatia provides a snippet from the piece, an estimated amount of time it will take to read the whole story and the word count (see below). In addition, there are also clickable links embedded in the newsletter that allow you to skip to certain sections, such as Industry News, Exchange News, Company News, etc. “The FIA Smartbrief is the briefest of the news briefs and aggregates the news from a DC perspective. As such, it’s heavy on regulatory happenings and, by reading it, you get an understanding of what’s important to the DC policy-makers. It’s big and can take some time to get through, particularly some of the long thought pieces. “TabbFORUM is a great resource because of the broad reach that they have across all financial markets and because Tabb Group themselves are market research experts. They have their finger on the pulse of all of the big issues facing the financial markets, and many of their contributors are at the top in their respective fields. Tabb has done a particularly good job covering issues around equity market microstructure and developments in the fintech space. Exchange News Service: a compendium of headline links that is published each day by Mondo Visione. While it has a spartan feel to it, and contains many articles that are arcane and down-in-the-weeds (e.g. “Financial Stability Board Regional Consultative Group For The Middle East And North Africa Discusses Financial Stability Issues, Regulatory Reforms And Macroprudential Frameworks”), it does a good job of capturing news items relating to Europe, Asia and the rest of the world that the other newsletters often miss. Redi Daily Digest: A solid aggregation of news from the trading-technology intersection. Boasting 7,500 subscribers, Redi’s version has a clean layout and doesn’t editorialize the news. We suspect this option is really good for Redi users since we can’t help but notice Redi news gets premium placement. 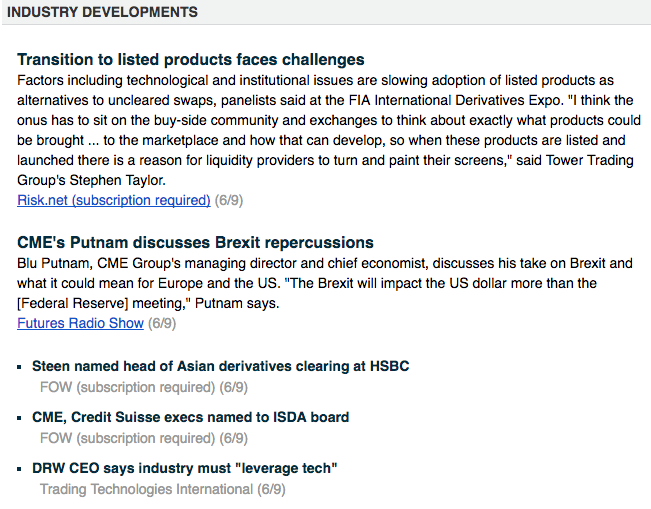 SmartBrief: In addition to the FIA SmartBrief mentioned above, SmartBrief publishes over 200 other daily newsletters. Topics and industries covered include the securities market, accounting, banking, commercial real estate, insurance and wealth management. Exchange Invest: “The Daily Newsletter of Market Infrastructure” takes a somewhat idiosyncratic look at the world of exchanges with a particular concentration on both Western and Eastern Europe. Traders Magazine: As a daily email with links to less than 5 articles, this isn’t a “go-to” newsletter, but they often have opinion and in-depth pieces that give excellent overviews and synopses of big, important issues. They also are leaders in covering the “sell side” in the securities industry. Automated Trader: This service focuses on trading from the point of view of technology. In addition to covering all asset classes, Automated Trader also lends insight into the latest technological and infrastructure developments. The newsletters above have given us inspiration to offer a custom ‘News Brief’ in our services for clients that want extremely detailed aggregation of news that pertains to their business and growth objectives. If you’d like to learn more about these newsletters or our custom news brief service please email us at info@3ptscomm.com.